President Obama just announced his selection for Supreme Court Justice – Judge Sonia Sotomayor. Elated that a woman will sit with the ‘old men,’ I have equally been moved and impressed by her story. Near tears throughout, I came to a full-blown sob when President Obama told of her being diagnosed with Diabetes at age eight. Her dreams thwarted—to be a detective or police officer and solve crimes, like her book heroine Nancy Drew—she took a different tack and worked hard to become a judge, instead. I could talk about the power of books and how they often help us reach our dreams. Instead, I just want to reiterate the power of the message. Diabetes didn’t stop her. People saying she couldn’t, didn’t stop her. I have a nephew who was diagnosed with Diabetes at age three. He graduated from high school this past weekend. He’s met with a number of obstacles along the way. I was proud to hear him say this weekend that he has a goal—to be an engineer for the government, likely something to do with the military. If all goes as planned, he'll be in school in Arkansas this fall. My heart warmed when he told me that. You see, my nephew comes from a military family—his father and both of his brothers have, and are, serving our country. With his Diabetes, he cannot. As an engineer, however, he can. 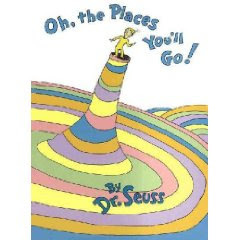 I bought my nephew a book I often buy for graduates, Oh, The Places You’ll Go, by Dr. Seuss. I inscribed it with my own message. I’m not sure if it will have any impact at all, or if it will guide him anywhere along the path that is set out before him—probably not at all like how Nancy Drew was a catalyst for Sonia Sotomayor. But the words and the message are there, and perhaps, the power of books and words, and the desire to do what is in your heart, will prevail. Good luck, Rhett. I believe in you and love you. And congratulations, Judge Sotomayor, on each and every one of your accomplishments. Good to read your blog. I've been missing your posts. LOVE the kitties.